Beth and Dona putting on a show. The back says” “Phyllis Diller gets an Oscar”. Chetek, July 1968. I was blessed with a whole bunch of cousins whose families would get together on holidays or for other special events. Often we cousins would put on a “show” for the parents. I wish we had videos of even one of those shows, because they would be precious to us now, but all we have are vague memories of them. I didn’t even know a photo existed of any of the shows until I was going through and scanning a bunch of photos I borrowed stole from my mom. 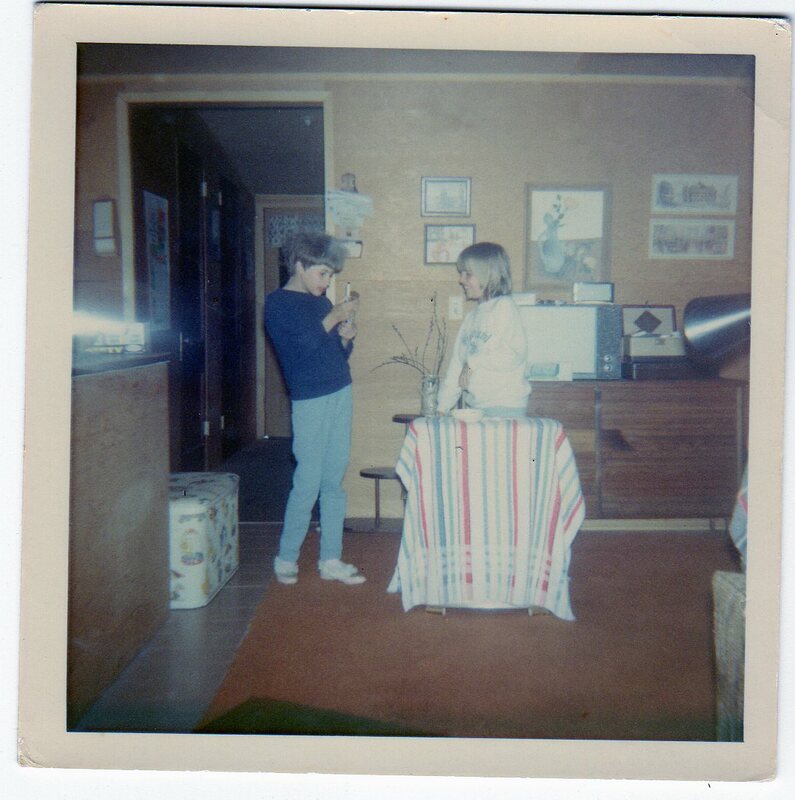 Here is my cousin*, Beth, and me (as Phyllis Diller according to the back of the photo — thank you Grandma, for writing on the back of photos!) in one of our shows. I do remember this one, but don’t remember any of the skits. I wonder if Beth does. Perhaps she’ll comment below. I wish I’d scanned this last week. I would have posted it on Facebook along with my RIP message to Phyllis Diller. How sweet! Second generation… continues… a tradition. I remember when I was little Pat and her girlfriends would dress us up (Bud, Nancy, me, David and Ginny) from old clothes in your Grandma’s attic on Raymond Street. Bud made the cutest girl with those beautiful curls and long eyelashes!! Then we would parade downstairs and “entertain” the folks who were usually playing pinochle around the kitchen table. Also, we used the sliding (pocket) door to the pantry as our elevator!! Thanks for conjurring up some more memories for me. Glad it brought back some memories, Judy! I loved Grandma’s attic (accessible through a door in the bathroom — the bathroom with a clawfoot tub!). I think I even remember the smell. She had one of those dress forms up there that I was a little afraid of. Sounds like you and your cousins were pretty sophisticated show producers. You and your cousins sound very theatrical. We used to just play softball or french cricket.